Since virtual machines can be easily moved between physical hosts (parents), it becomes important to track where virtual machines are physically residing for both asset management as well as troubleshooting purposes. The following post focuses on discovering the relationship between virtual hosts (parents) and the virtual machines (children) from both the perspective of the parent as well as the perspective of the child. Note: The following examples use the WinRM and WinRS command-line utilities which shipped with Windows Vista and Windows Server 2008, but are also available as an Out-Of-Band install for Windows XP SP2+ and Windows Server 2003 SP1+ here. 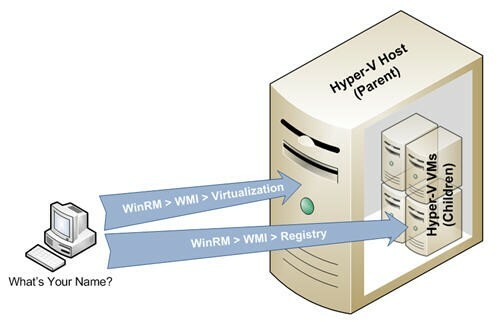 Most commonly used for asset collection, this model gathers the names (and other virtual machine characteristics) of all the children running on a virtual host. 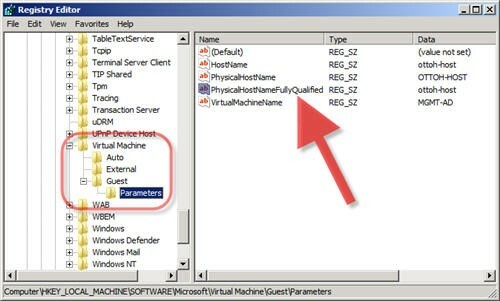 This method queries the Hyper-V specific WMI provider/class by using the following command. Note: The first method demonstrates a powerful way to access the value of any registry key using the ‘StdRegProv’ WMI provider via WS-Man/WinRM for remote transport. Other registry hives can be accessed with the following hDefKey values: HKLM=2147483650, HKCU=2147483649, HKCR=2147483648, HKEY_USERS=2147483651.